William Laman Furniture.Garden.Antiques - Rattan Dog Bed; Lg. Accessories → Baskets → Rattan Dog Bed; Lg. Item No. 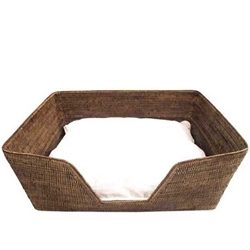 100 Large Sturdy Woven Rattan Dog Bed with cushion. The white pillow cover can easily be removed for laundering.